I’m Jeyaseelan Jenogitha from Mulliyawalai, Mullaitivu. 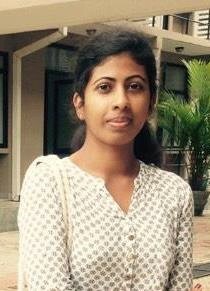 I’m in the final year of my studies at the University of Sri Jayewardenepura Faculty of Management Studies and Commerce. Upon completion, I had planned to get some experience and knowledge somewhere. But suddenly I got to know about the Sri Lanka Unites Reconciliation Center Mulliyawalai, Mullaitivu through my friends, so I thought joining this center would enhance my skills and experiences. We were the first batch of students from the Reconciliation Center Mulliyawalai. My first involvement with SLU started in 2013 and it was a life changing experience for me. I’m very much thankful to HSBC for providing me the sponsorship to get a free education through SLU. I had already completed my Diploma in Professional English Programme-2013 and Diploma in Information Technology with E-Commerce by Esoft Metro Campus. At that stage these courses were very much helpful to improve my English Knowledge and IT skills. We have a lack of resources to get this knowledge in our region so I hope this knowledge will improve my career and my University studies as well. During that time, some of us got the opportunity to participate in the Sri Lanka Unites’ Future Leaders Conference-5 that took place in Galle. This was the best opportunity of my life because it was the first opportunity that I had to work with people from different backgrounds in Sri Lanka. This helped me to have a better understanding of how people are in the real world apart from my imagination. My previous thoughts changed as a result of my experience at the FLC. I learned about reconciliation, leadership, and how to respect and to accept the values and traditions of different people in Sri Lanka which is important for a person from a diverse country. The leadership qualities that I learned from SLU are helping me in my day to day activities. I’m so thankful to SLU for providing me this opportunity. In addition to that, some of us got another chance to follow the Hairdressing and Beauty Therapy- Certificate level program in Colombo. This was a different experience to improve our Personality skills. In the more than one and a half years of my journey with SLU, I have met so many different people with different characteristics, who are still role models in my life. Through them I have obtained a wealth of good advice, technical skills, communication skills, languages skills and so much more. These benefits have led me to make better decisions in my life and career and I believe that will continue. I even had the opportunity to work for SLU for 6 months as a kid’s program trainer. This was a very nice experience to have with them. SLU gave me a platform to start my University Studies in Colombo, and now I feel very thankful to SLU because if I had not joined the Reconciliation Center, I would have lost many amazing opportunities and experiences. I hope in the future to contribute in various ways to the success of this Reconciliation Center in Mulliyawalai. I want to thank the management of the SLU for establishing this Reconciliation Center in our region, because they provide opportunities for youth in our community to improve their English, IT and entrepreneurship skills. I wanted to express my gratitude to the management of SLU and to all who have engaged with SLU. I’m proudly saying that you are the people who have helped us achieve our goals and have helped us to stay in a good position in society.